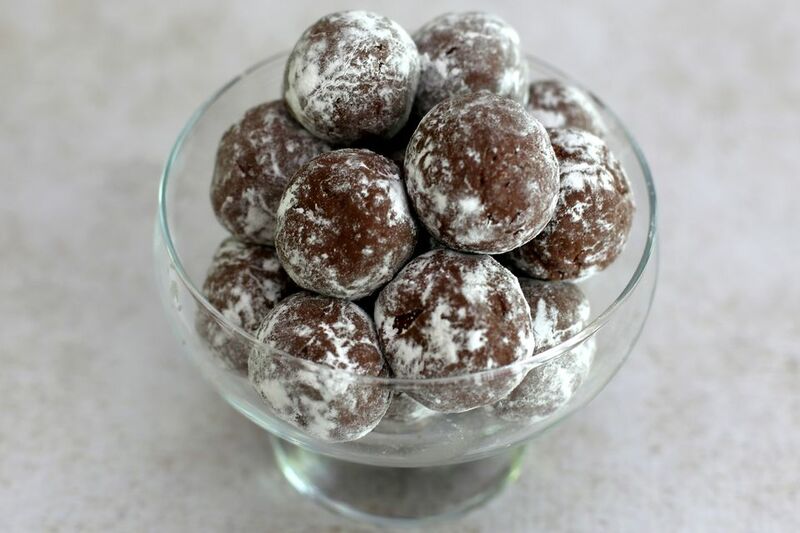 This is an easy no-bake chocolate candy treat, made with unsweetened cocoa powder and coconut, along with sweetened condensed milk and confectioners' sugar.​ The thoroughly chilled candy balls are rolled in more sifted confectioners' sugar, but you could also roll them in finely chopped nuts, cocoa powder, fine cookie crumbs or finely grated coconut or toasted coconut. In a large mixing bowl, combine confectioners' sugar and cocoa; stir in the sweetened condensed milk and the vanilla, mixing thoroughly. The mixture will be quite stiff. Stir or knead in coconut and nuts, if using. A heavy-duty mixer with paddle attachment makes mixing much easier, or use the dough hook attachment on a hand-held mixer. Chill the chocolate mixture for about 15 to 20 minutes, then shape into 1-inch balls. If the mixture is sticky, butter your hands if necessary. Arrange the candy balls on a baking sheet lined with wax paper or parchment paper. Cover the candy and chill the cocoa balls for at least 2 hours, or until they are quite firm. Store the chocolate coconut candies in tightly covered containers separated with sheets of wax paper. Use a small cookie scoop to help make the candy uniform in size, and then use your hands to shape them into smooth balls. Use a stand mixer to combine the stiff, heavy candy mixture or a dough hook attachment of a hand-held mixer. Use toasted chopped pecans and coconut in the mixture. Toast pecan halves in a dry skillet over medium heat, stirring constantly until lightly browned and aromatic. Repeat with the flaked coconut, if desired. Add 1/2 to 1 cup of chopped dried cherries or cranberries to the mixture. Add 1/2 to 1 cup of raisins to the candy. Add 1/2 to 1 cup of toffee chips to the chocolate mixture. Add chopped white chocolate to the chocolate mixture. Replace half of the vanilla extract with rum flavoring. Add 1 or 2 tablespoons of bourbon to the chocolate mixture. Roll the chilled shaped candy in finely chopped nuts, cocoa powder, confectioners' sugar, or finely grated coconut.